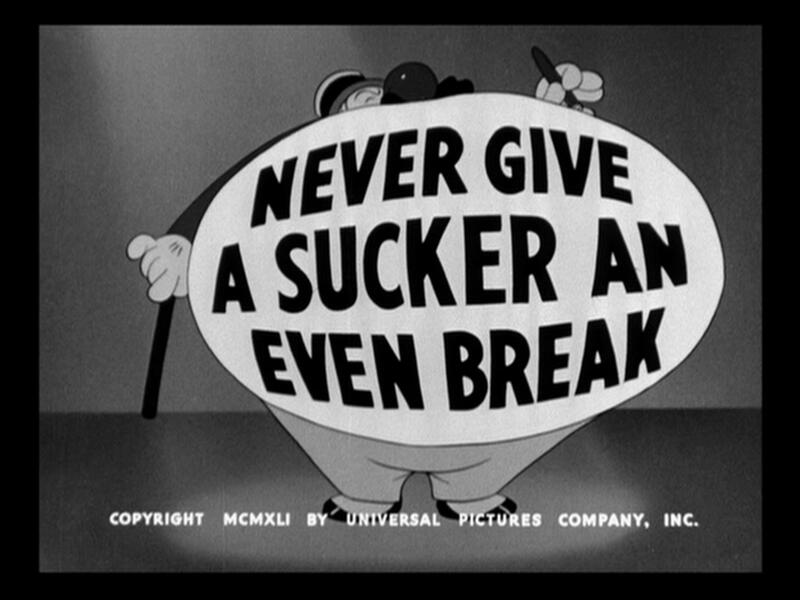 Universal’s 1941 production Never Give A Sucker An Even Break features W.C. Fields in his final starring role. 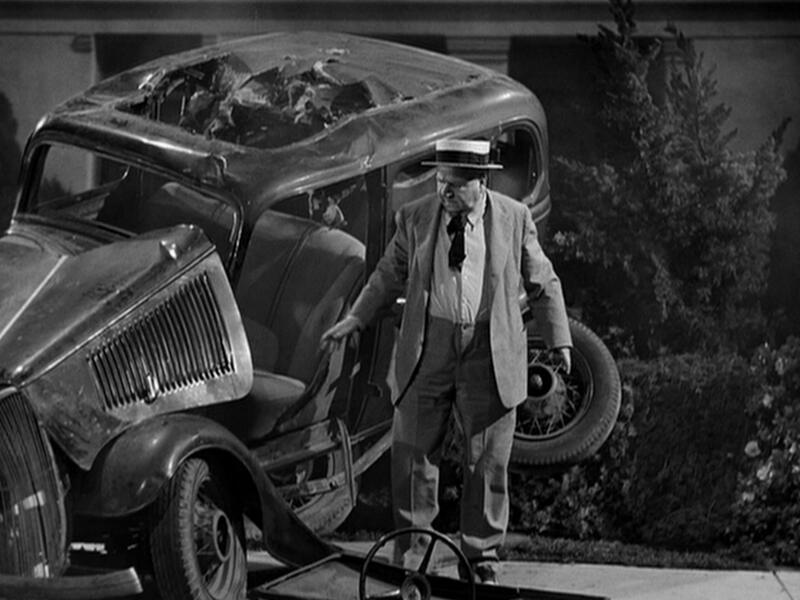 The film ends with a Keystone Kops-style car chase when Fields frantically drives a matron to the maternity hospital, mistaking her to be pregnant and in labor. 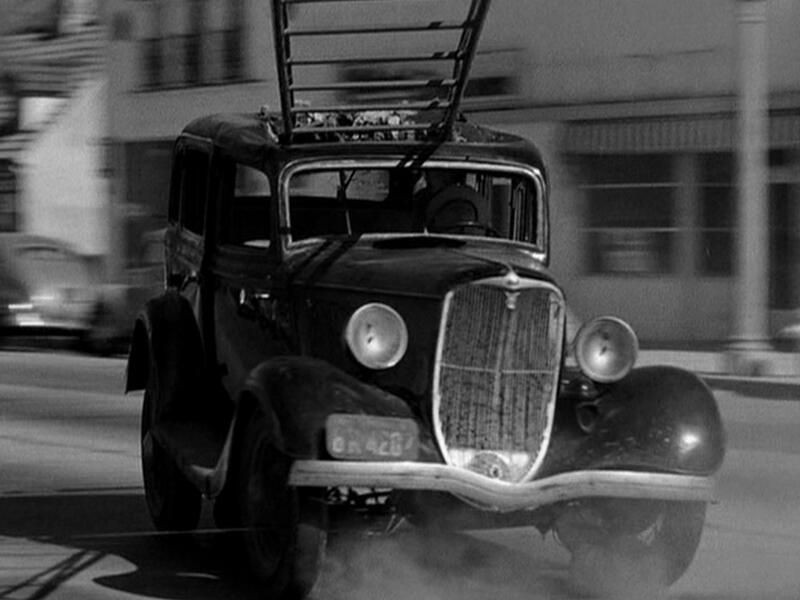 (The chase wasn’t part of Fields’ original script – Universal imposed it on him). As shown in Part One, the early scenes were filmed in a produce/warehouse district SE of downtown (see below), where a remarkable number of old buildings and street corners remain unchanged. Above, the intersection of Santa Fe and E. 7th Street. For Part Tw0, Fields leaves the gritty warehouse district behind for the open expanses of Cahuenga Pass, Glendale, and along Riverside Drive near Universal. First, looking SE, Fields races right to left (north) along Cahuenga Blvd. West beside the recently opened Cahuenga Pass Freeway. Note the trolley tracks in the center. 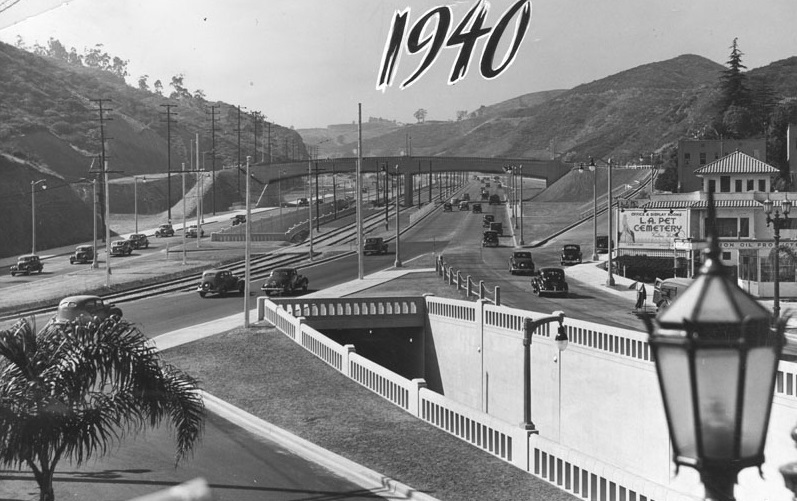 The eight lane artery, built at a cost of $1,500,000, was dedicated June 15, 1940. 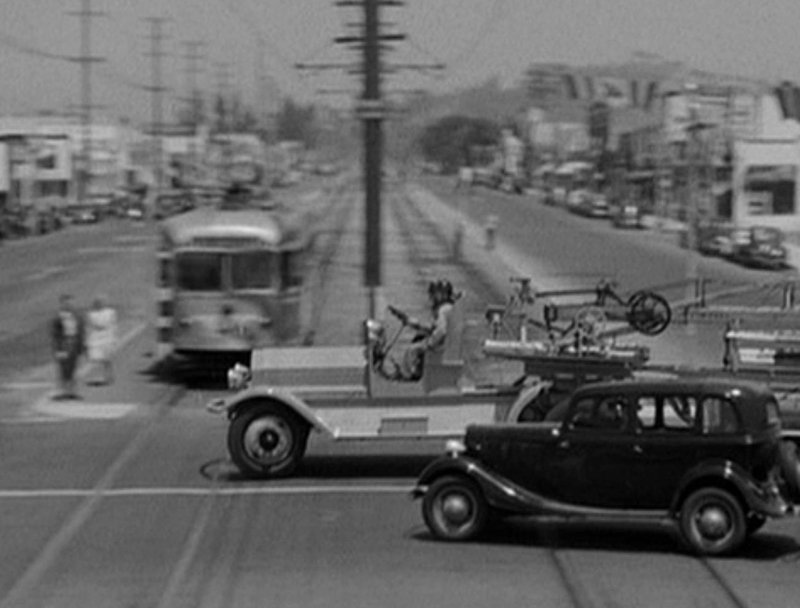 Some later stunt scenes were filmed on the freeway, meaning they were somehow able to briefly shut the pass down during the July-August 1941 production. The panning shot continues from right to left, north, showing the Barham Blvd. overpass across the freeway. The car veers left sharply up Bennett Drive. The first home on Bennett Drive still peeks down on Cahuenga. This view north also reveals a gas station (prices 14¢, 13¢, and 12¢/gallon), still a gas station today, and the side of 3201 Cahuenga, the present home of Valhalla Motion Pictures. 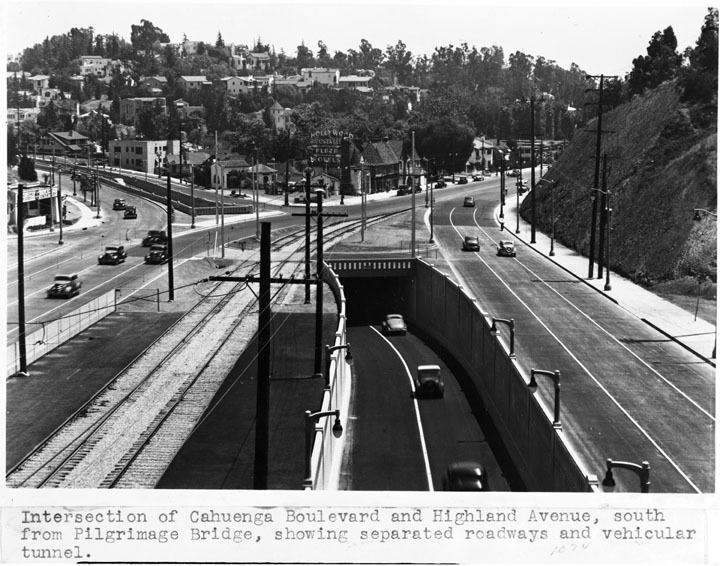 The action jumps south from Barham towards the former Cahuenga underpass near the Pilgrimage Bridge. Fields first circles the modest onramp/offramp north of the bridge (top), then travels south towards the Pilgrimage Bridge spanning the freeway (middle), and then heads into the Cahuenga underpass beyond the bridge (bottom). The freeway was configured so that the main traffic would head south at ground level onto Highland Avenue, while traffic heading south to Cahuenga, a few blocks to the east, was diverted through an underpass. The aerial view looks north, so the onramp is above the bridge, and the underpass entrance is below. If you clink the following URL link, you’ll see in the full photo that the Hollywood Bowl appears to the left of the freeway – Hollywood Bowl. While I was stumped, eagle-eyed reader Scott Charles correctly identified this One Way Tunnel shot as looking west on Cahuenga towards the eastbound traffic emerging from the underpass. The arrow (right) shows the camera’s point of view. You can read Scott’s full analysis in the comments section below, and HERE. A closer view, the red box marks the former home at 2313 Fairfield Avenue, the yellow box the last, eastern-most light fixture at the end of the guard rail. Looking north, not much of an offramp or onramp – LAPL. Another view north, the onramp lies just behind the bridge – California State Library. Matching views south towards the Pilgrimage Bridge. Looking south at the former Cahuenga underpass entrance – Department of Water and Power. Fields leaves Cahuenga Pass momentarily, jumping over to the Atwater Village neighborhood of southern Glendale. Here they race past the Superior Carpet Works building (notice the folded-design facade still present above the windows), still standing at 3058 Glendale Boulevard. The Safeway is now lost to a corner gas station. Note: this earlier scene above, appearing in the prior post, shows the former Atwater Market (center white building) at 3158 Glendale Boulevard, looking west, with the Pacific Electric trolley tracks to the right. In the far distance stands the Safeway noted above, and the Glendale-Hyperion Bridge, discussed later below. Looking NE, Fields and his motorcycle escorts join up with a fire engine. Together they pull a U turn along Glendale Blvd. at the intersection of Glenhurst Ave. Reader David Sadowski reports a brand new Pacific Electric double-ended PCC appears stopped at the intersection (left). These cars were put into service in November 1940, and were the pride of the interurban railroad. They ran on what would now be called a “light rail” line between Glendale-Burbank and a subway terminal in downtown LA. There are some great views of these same railcars and the PE subway in Down Three Dark Streets (1954) reports David. The Glendale-Burbank line was abandoned in 1955. Above, completing the U-turn, as the crew returns down Glendale past the corner of Glenfeliz Blvd. some matching homes appear at back. Next, the fire engine’s extension ladder slips loose, hooking its tail end through the roof of Fields’ car. These views above of Fields’ ensnared vehicle looks SW while traveling across the Glendale-Hyperion Bridge. Completed in 1929, the bridge spans over 400 feet of the Atwater section of the Los Angeles River. The lower right image on the bridge shows the trolley line power poles heading across the river. This brief insert shot (left) of Fields spinning 360 degrees was filmed at the intersection of Riverside Drive and Forman Avenue, discussed further below. The upper view east looks down on the bridge from the Waverly Drive overpass, while the lower view looks east from the bridge itself. 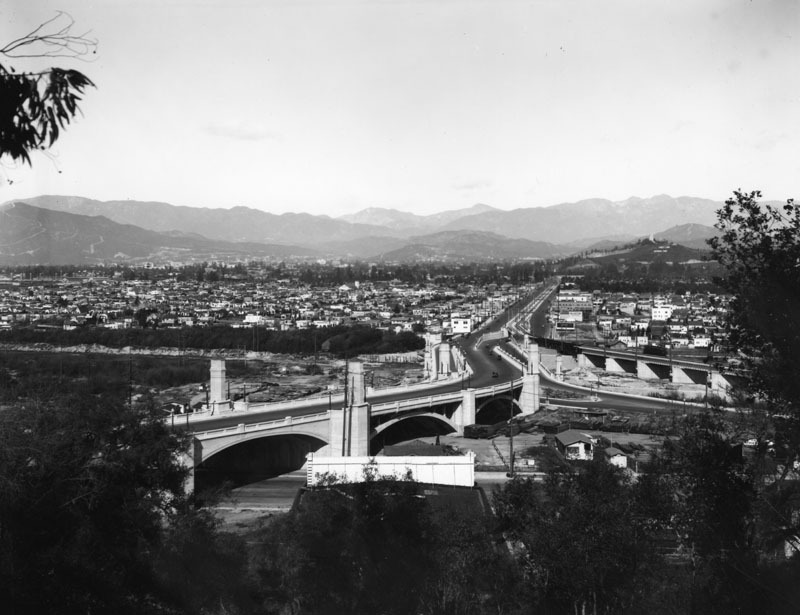 At right is a vintage view (LAPL) looking east across the bridge and up Glendale Blvd. You can see the trolley tracks along the middle of the street, and how they veer right, south, across the river, on a separate trestle. The white letters on the back hillside say “Forest Lawn Memorial Park.” The chase now resumes at Cahuenga Pass – below. Here the camera pans right to left as Fields’ ensnared car travels north along the original, now-shuttered Barham offramp. The road beside the upper railing is Cahuenga Blvd. East. A new stretch of this road, extending further north beyond Barham, is now called W.C. Fields Drive. Notice the diamond shaped shadow of the four-cornered rig suspended from a crane actually lifting the car. The chimney of 3137 Hollycrest Drive appears at back, now missing its ornamental ironwork. Still looking south, Fields’ car slams onto the ground beside the former Barham offramp. The matching 1952 color view from the Pacific Electric Historical Society looks south from the Barham overpass towards streetcar #5111 and the southbound Barham passenger station. Alan Weeks Photo, Alan Weeks Collection. A final view (LAPL) looking north towards the Barham overpass and offramp. The gas station, upper right frame, appears to the left, the back of 3137 Hollycrest Drive, lower right frame, appears to the right. The street on the right edge of the primary photo was later extended past Barham – this new section is now called W.C. Fields Drive. The full crew pull a couple of 360 degree turns beside the former Lakeside Market looking south down Mariota at the intersection with Riverside Drive, a few blocks due north from Universal. This tight view 360 turn appears for the second time. These matching views look east down Riverside Drive from Forman Ave., two blocks west from the Lakeside Market. This detail from the 360 degree spin shows 4432 Forman at back. The same 360 degree spin – the blurry tower at back belongs to the Lakeside Market, two blocks east. The Kentucky fried chicken dinner restaurant on the NE corner of Forman is now a Japanese restaurant. The End – fade to black. While Fields’ drinking and prominent nose were always ripe for caricature, given his poor health and evident nasal rosacea during the film, it seems a bit tone-deaf for Universal to portray him this way for the credits of what proved to be his final starring role. Be certain to check out all of the downtown warehouses and street corners in Part One of this post. Below, Riverside Drive and Mariota, just north of Universal Studios. This entry was posted in W.C. Fields and tagged Atwater, Cahuenga Pass, Cahuenga Pass Freeway, Glendale Boulevard, Glendale Hyperion Bridge, Hyperion, Never Give A Sucker An Even Break, Riverside Drive, then and now, W.C. Fields. Bookmark the permalink. Thank you for this great post and all your tireless research. If Universal insisted on a chase scene for the final part of the movie, it may be because of Fields’ drinking and his declining health. The studio dropped him after this film, and he never had another starring role again. Thanks – reminders of home. I was born in Atwater, on Hollypark Place near Glen Feliz (across the street from Glen Feliz Elementary) so this brings memories. We were a movie family – Dad and Uncle Donald used to sneak around the permanent sets on the Lasky Ranch, Gramps owned the first cabin at Crystal Cove (built for Gloria Swanson’s Rain), Dad used his knowledge of chemistry to help Ingrid Bergman win her first Oscar, his boyhood pal – our neighbor in Atwater – became Disney Legend Bob Broughton, and my second mother worked for DeMille and others in the silent days as script girl and asst film editor. So these are always enjoyable to read; but this one, especially, so close to home. I’m also working on a book which has a section on the old Atwater Days, so this will be a useful reference. Cheers. Hello, John! Thanks for another great post! I *believe* I have identified the location of the shot that eluded you in this article. Please view the linked jpeg and let me know what you think. You are the Great Detective, so of course I defer to you! Many thanks, John! It really is my honor to play (even a minor) role in yet another one of your amazing sleuthing efforts! While the unearthing of old silent movie locations may seem to be a rarefied pursuit to some, to me it’s the perfect intersection of several of my own interests/obsessions – my grandfather was a silent movie director, his brother was a silent era stuntman, my great-aunt was one of D.W. Griffith’s personal secretaries, and my grandmother was a Mack Sennett Bathing Beauty – she’s the second-from-the-left Beauty in the “Hearts and Flowers” screenshot on your “How Charlie Chaplin Filmed The Adventurer” page – so I have always been fascinated with the silent movie era. Though none of my relatives are (or were) anything even close to famous, I still grew up with a feeling of great personal connection to the silents. My dad and uncles loved to tell stories about “the old days”. In addition, I have always been a fan of old Los Angeles architecture, and have spent decades exploring the classic Beaux-Arts and other early-style buildings in Downtown LA and the surrounding areas. Often, I would come across some once-grand/now-skid-row faded beauty of a hotel and think to myself, “I wonder if Chaplin/Lloyd/Keaton ever filmed here?” – so when I discovered your Harold Lloyd book on Amazon a few years ago, I was thrilled to find something so right up my alley! I ordered it immediately, and upon reading it, discovered that you had written books about Chaplin and Keaton as well, which I of course, ordered – all three are astounding books, thank you so much for creating them! So please keep up the excellent work, John – your examinations of the settings of silent movies are always a great thrill to read! Thanks from me, too, John. I”ll use that lantern to research the Atwater section of my new book. My second mother may or may not be listed in one of those sources; but she did room with Laura La Plante and knew Tui Lorraine, so perhaps through those connections. A HUGE thanks for that Lantern Media link, John! I spent all last night looking at search results for my surname. I found 65(!) links to members of my family – roughly 50 pertaining to my grandfather, with the others divided between my grandmother and my great-uncle. Reading through those records, I found out some truly fascinating information that I didn’t know before. One 1920 listing mentions my grandmother *by her maiden name*, with my grandfather working as director on the same project. Maybe this is where they first met? And one listing had a photograph of my grandfather that I’ve never seen before! Several of the links from 1920 refer to my grandfather as a “former Keystone AND ROLIN director” – which I believe would place him at the *first* Rolin studio (aka, Harold Lloyd’s “Pneumonia Hall”, the gorgeous Bradbury Mansion) at the same time that Harold Lloyd (and perhaps Chaplin) worked there! This would be amazing to me if true! I knew my granddad worked for Mack Sennett, but this is the first time I’ve ever heard that he worked for Hal Roach. My great-uncle (the stuntman) worked for Roach extensively, both with Laurel and Hardy and the Our Gang troupe, so it seems quite possible that my grandfather did, too. Perhaps most shockingly, one of the listings says that my grandfather was directing a film with legendary D.W. Griffith colleague Billy Bitzer working as the cameraman! John, I’d be happy to email you the jpegs of the pages I found at Lantern Media (if you have any interest in seeing them) – I think it would be too unwieldy to post 65 link/images in this blog response.